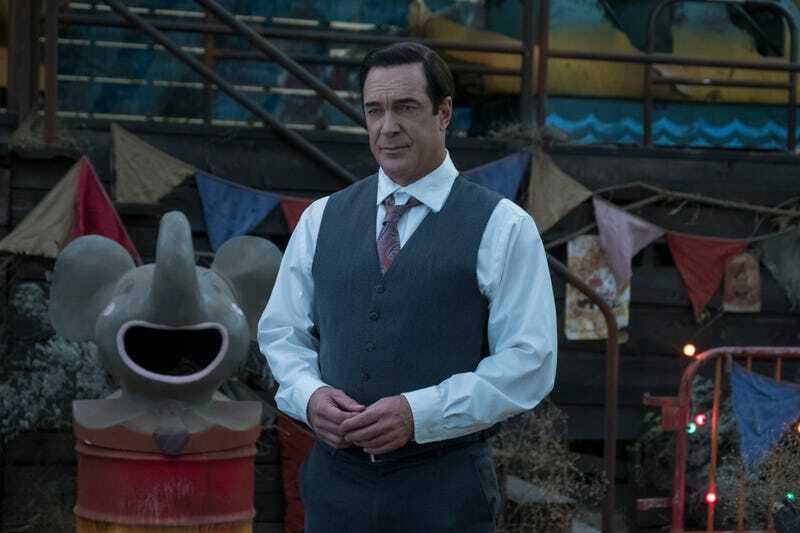 It seems entirely natural that A Series Of Unfortunate Events would find itself at a carnival. The setting—a once happy place now fallen into disrepair, a ghost of its former self stuck shuffling forward until it finally realizes it’s dead—is a perfect locale for the Baudelaires’ misadventures. The only real surprise is the lack of clowns. "The Carnivorous Carnival, Part One"
Actually, check that, there’s more than just one surprise here, and the first is maybe the most unexpected: a flashback to before the Baudelaires were born, when V.F.D. was at its peak and many people who are now dead were still alive. It’s the clearest glimpse we’ve had yet of the secret organization that was the start of so many of the current troubles, and while we don’t stay long enough to get a complete story, the hints are enough to tantalize. We see several familiar faces, and Lemony in his element; we also learn that “Olaf knows,” and linger just long enough to see the Count charging a woman in a dragonfly costume as Lemony watches helplessly from the balcony above. The main action of “The Carnivorous Carnival, Part One,” though, takes place in the present at Caligari Carnival, a presumably once popular attraction which has since fallen on hard times. Following a flier (and an earlier reference) about a mysterious Madame Lulu, Olaf and his troop arrive and take the place over, with Olaf installing himself as the ringleader of the carnival’s sole remaining attraction: a trio of seemingly nice people who have taken society’s judgement to heart and accepted their lot as freaks. I say “trio,” but that’s not quite accurate. The group doubles in number soon after Olaf arrives, with the addition of three new members: Violet, Klaus, and Sunny, in the guise of a two-headed person named Beverly and Eliot, and Chabo the wolf-baby. The plan is to hide out in plain sight at the carnival (under some dirt and clothes from Olaf’s disguise stash) until they can get their own answers from Madame Lulu. It’s a relief to see that the show has no intention of going back to the usual routine after the events of the previous storyline. There’s not even an illusion of safety here for Olaf to puncture. It’s danger from the get go, with some bonus humiliation as a side dish. Still, there’s at least a possibility of a helpful guardian here, as Madame Lulu turns out to be a very familiar face: the briefly absent Olivia Caliban, in disguise and stringing Olaf and the others along as best she can. (Esme is not impressed.) It’s a convincing costume as well—while most of the show’s disguises are intentionally obvious for comedy purposes, Olivia’s Lulu get-up is easy to fall for, as is her act. Bringing her back now makes sense, and it’s a relief to get at least an implied explanation as to her disappearance after Jacques’ murder. Per the usual, this entry is mostly set up that builds to the Baudelaires’ discovering a treasure trove of clues in “Lulu”’s wagon, including a collection of film clips taken at the party we saw in flashback. The clips also show the children Lemony Snicket for the first time, and there’s a small thrill in the orphans getting a glimpse of their biographer, even though they have no idea who he is. They discover a collection of disguises much like their own—still more evidence that Olaf was once part of V.F.D. And they even deduce what “V.F.D.” stands for: “Volunteer Fire Department,” which is just odd enough, but just right enough, to be quite satisfying. Things drag a little here and here (Olaf gets another musical number during the “freak” show, which would’ve worked better if we didn’t already know what the “freaks” did; it seems more than a little redundant), but never loses the thread completely. 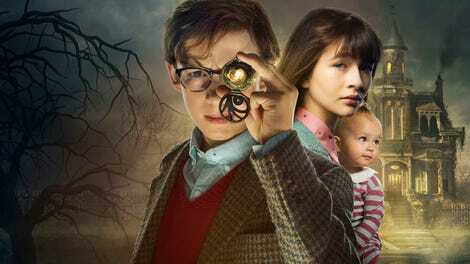 In the end, the Baudelaires are reunited with their librarian friend, only for Lemony to warn us that things are about to get much, much worse. For once, the warning doesn’t sound routine. I guess Larry was always a waiter? Lulu tells Olaf that one of the Baudelaire parents survived the fire, but she’s just stalling for time. The carnival is near Mortmain Mountains, home of the V.F.D. headquarters in the flashback from the start of the episode. Okay, Lemony does briefly show up as a clown. But he’s the only one.